WASHINGTON ― Some of the most prominent U.S. foreign policy figures urging a tough response to the killing of Saudi journalist Jamal Khashoggi are earning thousands of dollars each month from the United Arab Emirates, Saudi Arabia's closest partner and a vocal defender of the Saudi narrative about how he died. It's a stunning situation that underscores how Middle East powers aligned with the Saudis and the U.S. are doing damage control amid the scandal - sustaining their relationship with the biggest player in the Arab world while trying to keep Western partners happy so their own human rights records and behavior don't come under similar worldwide scrutiny. Publicly, countries like the United Arab Emirates, Egypt, Lebanon and Jordan have come out in support of the Saudis in multiple statements. Privately, government leaders in those countries are having discussions similar to those of officials in Western capitals about whether the killing and aftermath show that de facto Saudi leader Crown Prince Mohammed bin Salman isn't up to the job, experts said. And all the while, such countries' paid friends abroad are helping them hedge their bets. Rich Mintz, the UAE's powerful longtime lobbyist in Washington and an adviser to the wealthy monarchy's leadership, made his firm, the Harbour Group, the first to drop a contract with the Saudis. The widespread news coverage of that move allows Mintz to claim that he ― and to some degree his client ― place morality above profit. Former Foreign Policy magazine editor David Rothkopf, who now earns $50,000 a month to help craft the UAE's public image in the U.S., has for weeks used his perch as a noted Twitter and cable television critic of President Donald Trump to boost attacks on the Saudis' shaky narrative about Khashoggi and on the crown prince in particular. Middle Eastern governments are hewing to the Saudi line in public because of the massive financial help some of them receive from the kingdom and because of their officials' worries, amplified after Khashoggi's killing, that the Saudis will respond with unprecedented anger to any expression of dissent, said Lina Khatib of the Chatham House think tank in London. Regional officials are now weighing how to handle Riyadh and how they will shift their approach if the kingdom ― the dominant force in the Arab world ― becomes increasingly preoccupied with domestic struggles and grows isolated internationally. Egyptian officials are quietly questioning the prince's handling of the crisis, Khatib said. But on Monday night, Cairo offered its latest signal of support when Egypt's foreign minister flew to Riyadh carrying a message from President Abdel-Fattah el-Sisi to Saudi Arabia's King Salman. "Most people are basically worried that Saudi Arabia is going to enter a period of darkness and a period of the country being more closed," Khatib added. Solidarity with Riyadh is important for regimes used to getting away with human rights violations despite their association with Western governments pledged to upholding democratic standards and uninterested in a radical change in that bargain. The UAE, for instance, faces multiple allegations of war crimes for its participation in a Saudi-led military campaign in Yemen, and it is holding a British academic in solitary confinement, one of many people accused of threatening the security of the government and provided little due process. Egypt, the destination of billions in U.S. taxpayer dollars annually, has tens of thousands of people in its prisons and on Sunday arrested a well-known economist who wrote a book questioning the government's policies. Israel, which is a quiet partner of the Saudis in their regional rivalry with Iran and frequently likes to remind foreign audiences it is the most advanced democracy in the Middle East, appears to have little interest in accountability for Khashoggi's killing either. Meanwhile, Iran and other powers sparring with Riyadh, like Qatar, are spreading the message about how pleased they are about the crisis, a European official told HuffPost. Combined with Turkey's seemingly deliberate campaign to use the moment to boost its regional standing, that reality has countries content with the status quo, like Jordan, nervous about any shift that might rock the boat ― no matter how good the intentions for, say, reducing Western military cooperation with Saudis. 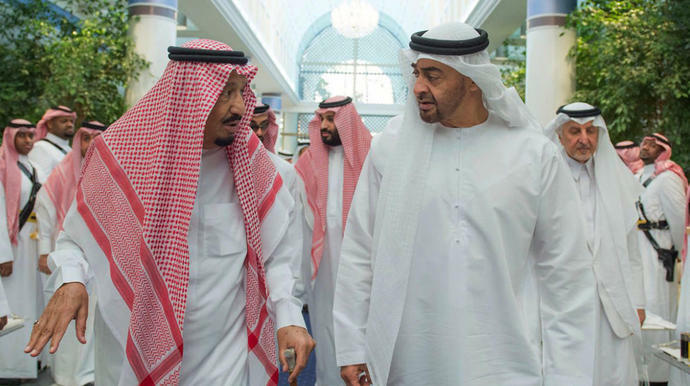 Few in the Saudi camp are for now eager to turn to the kingdom's foes, Khatib said. A united front is, then, likely to persist, even though rights groups and experts say it's objectionable and possibly counterproductive to letting Arab societies thrive. In Washington, Rothkopf wrote that Mohammed "cannot be a credible partner of a state to which values matter." From the UAE, his employers will continue to say things like, "The Kingdom of Saudi Arabia, represented by its leadership, always has been and remains to be, a nation built on just and fair state institutions."